These hallmarks were randomly posted on the home page and now archived here. "World Hallmarks" book series, each available here. This is the fineness hallmark that identifies the purity of the precious metal, in Arabic, as tested by the Egyptian Assay Office. The Arabic numerals here are a 9 and 0 - '90', (representing 90% or 900/1000). Above the fineness is the abbreviation, in Arabic, for the assay office that tested and hallmarked this item. In this case it is the abbreviation for the Cairo Assay Office where the item was hallmarked. On the right is the date hallmark representing the year the item was hallmarked. In the beginning, the year was represented by a letter from the English alphabet and changed every year. In 1940, the letters were changed to the Arabic alphabet and the changing of letters was not as strict. The letter in this example is the Arabic letter for 'sh' that was used from 1962-1964. The triangular shape of this hallmark is unique and identifiable for the region. The 'cross over three hills' design within the triangle was used from 1929-1941 in the area known at that time as Czechoslovakia. The number 4 indicates the item is constructed of the fourth silver standard of the period - 835/1000 parts silver. The eagle's head hallmark is commonly seen on French made items of gold since 1838. It represents an item that has tested to be constructed of a minimum 18k or 750/1000 parts gold. The dog's head hallmark on the right is the French hallmark for platinum items that test to be a minimum of 950/1000 parts platinum but was not introduced until 1912. These two together indicate that both metals are present in the piece. The order and orientation of the two hallmarks can provide more specifics on the ratios of the different metals that make up the item, as well. This hallmark was used in Poland from 1920 to 1931 on only silver items. The number 3 indicates the item is of the 3rd silver standard designation used at that time - 800/1000 parts silver. 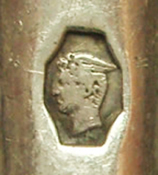 The W on the right side of the female's left facing profile indicates the item was hallmarked in the Warsaw Assay Office. The barrel shape outline tells us that the item marked weighs more than 10 grams. This rooster facing left is an example of a more recent hallmark used by the Czech and Slovak Republics indicating a small domestic gold article of the 3rd standard - 750/1000 parts gold. This hallmark is one of the few Czech and Slovakian hallmarks that has been in use since 1921 that has remained unchanged. This is an example of the inclusive design of the Soviet Russian hallmark. Contained within the rectangular (actually is a shovel shape) frame shape outline hallmark that exhibits 1) a Soviet hammer and sickle within the star shape, 2) the 583 is the Russian gold standard for 14k gold (583/1000), 3) a Cyrillic symbol to the left of the star represents the assay office where the item was marked - Tbilisi, in use from 1958 until 1994. The second hallmark on the left, a pointed frame shape, is the maker's mark. The letters to the right are the unique initials of the maker with the number representing the date aspect of the mark. Do you know what is wrong with these stamps and why? Email us, and let us what you think! 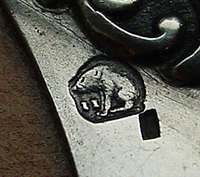 This single hallmark is inclusive in style by the fact that this hallmarks reveals that the item was imported to Austria after 1965 (the cocker spaniel image was used after 1965), the item was assayed in Salzberg (the S stands for the Salzberg Assay Office) and is of 14k gold. The number 4 stands for the 4th standard for gold in Austria which is 14k or 585/1000 parts gold. Often hallmarks are designed with imagery of landmarks, famous people or royalty, or, in this case, treasured national objects as their core image. This hallmark depicts a national treasure - the Pahlavi Crown of Iran. 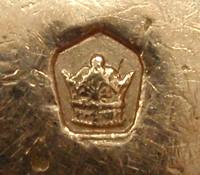 This crown hallmark was used in Iran from 1967 to the late 1970's. It would be stamped on gold that would be either 917/1000 (22k) or 750/1000 (18k), differentiated by the frame. This sitting boar is a hallmark from Portugal. The frame shape or outline of this hallmark indicates it was assayed in Lisbon between the years of 1886-1938. The II indicates the 2nd standard of silver - 833/1000. The design of this hallmark tells us that the item was a large silver object. As a left facing ram's head, this French hallmark was used from August 16, 1819 to May 9, 1838. Finding this mark indicates the item has tested with limited warranty by touchstone to be a minimum of 18kt or 750/1000 parts gold. Origin of the mark is Paris, France. This left facing head of Mercury with the octagonal outline and scalloped corners was marked on large French silver items exported out of France between 1840 and 1879. It represents a metal content of either 750 gold or 950 silver, minimum. This French owl hallmark has been used since 1893. This owl in an oval frame shape hallmark represents a gold item that is imported from a country whose standards do not comply to French Customs fineness standards. Note the number on the owl's chest and read about it below. In a country that has numerous Assay Offices, it is common to use a secondary mark within the actual hallmark to indicate which Assay Office conducted assay testing and hallmarking of that item. In France, there are numerous testing laboratories across the French Departments (states.) Each office has its own unique symbol that they mark within the hallmark's frame or on the core image. The World Hallmark books utilizes a question mark (?) to indicate the location of this variable, if one so exists. 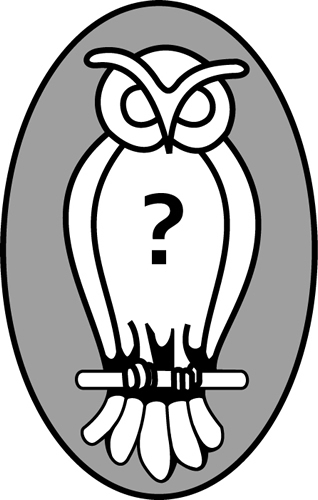 In the illustration on the left the symbol is located on the owl's chest. In the photo above that graphic, the symbol is the number 75 which is a nationally recognized region number for Paris, hence representing the Assay Office located in the Paris Area. 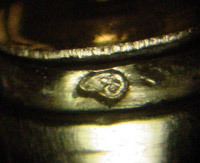 This hallmark is another example of a mark that reveals the town where the item was hallmarked. This image reveals, by the large Arabic abbreviation in the center of the oval, that this item was tested and hallmarked in Aleppo, Syria. In the upper left corner of the oval are two digits in Arabic that represent a '2' and a '1' which means the item tested as a minimum of 21k gold. only if the image is accompanied by proper recognition. "Image from the Hallmark Research Institute"